Growing up in the Midwest, I went apple picking every fall and loved to drink mulled hot apple cider. Although apple cider the way I grew up drinking it is really not consumed in Mexico, I came up with this recipe with the traditional American apple cider in mind; it’s made with apples that are easily found in Mexico along with Mexican cinnamon sticks, chile puya for a little kick, and sweetened with piloncillo — all ingredients that are muy mexicano. 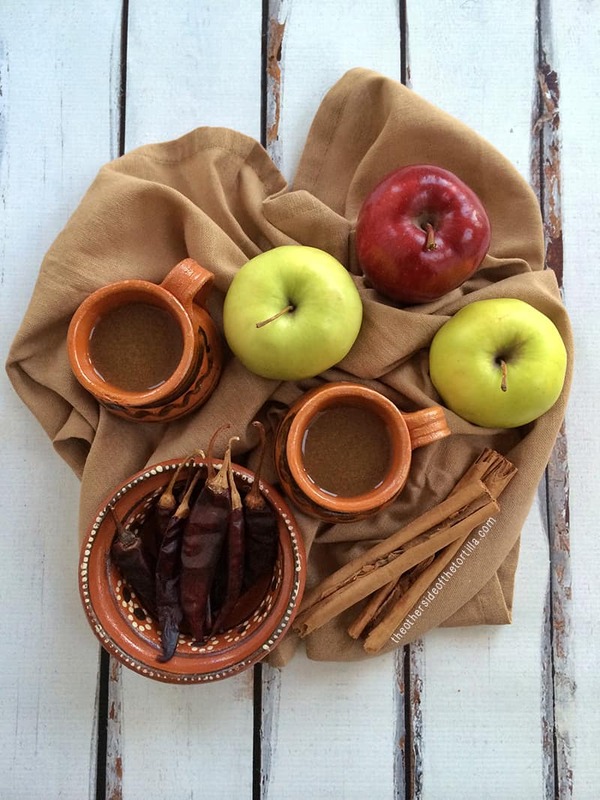 Chile puya brings an earthy, fruity, moderate heat to this mulled hot apple cider that can be served with a splash of brandy on cold winter nights. It’s the perfect warm cocktail to serve during the holidays as well! Chile puya looks just like a smaller version of chile guajillo, both in color and shape, but is spicier. If you can’t find chile puya, or want a milder spice, you can substitute a guajillo chile in this recipe. I advise that you start out with one chile and work your way up if you think it needs to be spicier. Either way, be sure to remove the seeds and veins inside the chiles….